On the 16th (Thu), see the interesting displays at Jewish Museum of Maryland and then take in the architecture and atmosphere at Saint Alphonsus Church. Here are some ideas for day two: examine the collection at National Air and Space Museum and then explore and take pictures at National Mall. To find where to stay, traveler tips, other places to visit, and tourist information, read Baltimore trip itinerary planner. Frankfurt, Germany to Baltimore is an approximately 12-hour flight. The time zone changes from Central European Time (CET) to Eastern Standard Time (EST), which is usually a -6 hour difference. Plan for somewhat warmer temperatures traveling from Frankfurt in May, with highs in Baltimore at 28°C and lows at 17°C. Cap off your sightseeing on the 18th (Sat) early enough to travel to Orlando. Visit Cocoa Beach and Hightower Beach Park for some beach relaxation. Step off the beaten path and head to Ponce de Leon Inlet Lighthouse & Museum and The LEGO Store Downtown Disney. Change things up with these side-trips from Orlando: Catholic Church of the Epiphany (in Port Orange) and Beach at Daytona Beach (in Daytona Beach). Have a day of magic on the 20th (Mon) at Walt Disney World Resort. Pack the 19th (Sun) with family-friendly diversions at Universal Orlando Resort. There's still lots to do: laugh and play at SeaWorld Orlando and discover the magic at Happily Ever After Fireworks. For where to stay, traveler tips, maps, and more tourist information, use the Orlando vacation planning app . Traveling by flight from Baltimore to Orlando takes 4.5 hours. Alternatively, you can do a combination of train and flight; or drive. Traveling from Baltimore in May, things will get somewhat warmer in Orlando: highs are around 36°C and lows about 24°C. Finish your sightseeing early on the 23rd (Thu) to allow enough time to travel to Lubbock. Lubbock is a city in and the county seat of Lubbock County, Texas, United States. Satisfy your inner culture vulture at OS Ranch Foundation Museum and Buddy Holly Statue and West Texas Walk of Fame. Eschew the tourist crowds and head to Muleshoe National Wildlife Refuge and National Ranching Heritage Center. Change things up with a short trip to Garza County Historical Museum in Post (about 54 minutes away). There's lots more to do: do a tasting at LLANO ESTACADO WINERY, INC., see the interesting displays at American Wind Power Center, and pause for some photo ops at Lubbock Veterans Memorial. To find traveler tips, ratings, and tourist information, read our Lubbock visit planner . Traveling by flight from Orlando to Lubbock takes 7 hours. Alternatively, you can drive; or take a bus. The time zone difference moving from Eastern Standard Time to Central Standard Time is minus 1 hour. Traveling from Orlando in May, expect Lubbock to be a bit cooler, temps between 33°C and 14°C. Finish your sightseeing early on the 26th (Sun) so you can travel to Tucson. Get some historical perspective at Mission San Xavier del Bac and St. Anthony's Greek Orthodox Monastery. 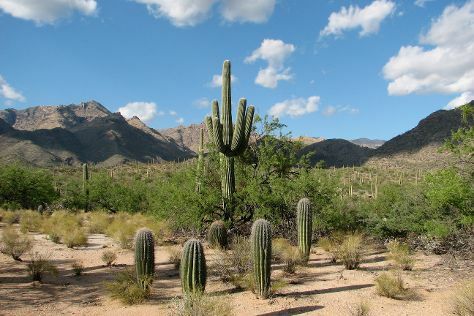 Get outdoors at Sabino Canyon and Kartchner Caverns State Park. Explore Tucson's surroundings by going to Quarles Art Gallery (in Benson), Boyce Thompson Arboretum (in Superior) and Wilhelm Family Vineyards (in Sonoita). Next up on the itinerary: see the interesting displays at Pima Air & Space Museum, take an in-depth tour of O.K. Corral, tour the pleasant surroundings at Agua Caliente Hill Trail, and engage your brain at Asarco Mineral Discovery Center. To find photos, ratings, maps, and more tourist information, read Tucson online attractions planner . Do a combination of flight and shuttle from Lubbock to Tucson in 5 hours. Alternatively, you can fly; or drive. The time zone changes from Central Standard Time (CST) to Mountain Standard Time (MST), which is usually a -1 hour difference. Expect somewhat warmer evenings in Tucson when traveling from Lubbock in May, with lows around 18°C. Wrap up your sightseeing on the 31st (Fri) to allow time to travel back home.